Recent advances in medicine for resuscitation and care have led to an increased number of patients that survive severe brain damage but who are poorly responsive and non-communicative at the bedside. This has led to a striking need to better characterize, understand, and manage this population who present a real challenge for the assessment of pain and for planning treatment. This edited collection provides clinicians with a guide to recent developments in research on pain perception and assessment, and the detection of consciousness and communication in patients with disorders of consciousness (DOC). 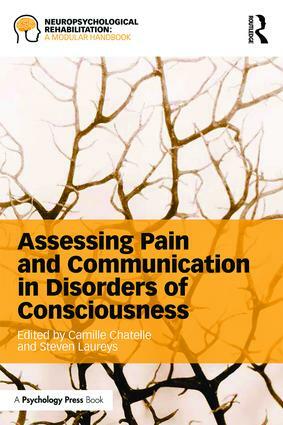 With contributions from leading global researchers, the book gives an overview of issues concerning the assessment of pain. It also covers the development of suitable tools both to improve pain management and to detect consciousness and communication in these patients, to influence their prognosis and treatment, and their quality of life. Methodological and ethical issues concerning the implication for future research are also considered. The book will be an invaluable guide for clinicians, medics and therapists working in rehabilitation and acute care, particularly in the demanding field of pain perception, pain assessment and detection of consciousness and communication in patients with DOC. It will also be useful for students and researchers in neuropsychology and medical sciences.